Regular readers will know that everything on this earth is comprised of energy, and it all vibrates at different frequencies. Sometimes this is good and sometimes it’s not so good. The earth emits a natural electromagnetic field that is beneficial - indeed, necessary - for all biological beings, i.e. those dependent on oxygen. Unfortunately, this beneficial energy can sometimes become corrupted by such natural phenomena as underground flowing water, fault lines, changes in rock strata or mineral beds. This can result in detrimental, even hazardous, energy vibrations, affect people and animals adversely, and is known as Geopathic Stress (GS). You may have noticed for yourself that some places feel good, uplifting, whereas other places can feel oppressive and unpleasant. In his talk at Slimbridge Dowsing Group on Thursday, 14th May, Chairman Peter Golding explained that if your bed or your favourite arm chair happens to be over such stress lines, you can feel unwell, depressed, suffer from lack of sleep or become seriously ill. Communication within our body cells can become scrambled, and the cells confused. Cancer is often associated with this phenomenon, as are arthritis, MS, sudden infant death syndrome (SIDS), insomnia and chronic fatigue syndrome. Yet interestingly, these adverse vibrations are good for bacteria and fungus, which will actually thrive. Cats are drawn to it too, whereas dogs will avoid it at all costs. A couple sharing a home affected by GS might find one of them is affected and not the other. Frequently, women seem more sensitive to GS, thought to be because their ovaries will resonate at a different frequency from that of the male prostate. If this sounds like so much mumbo-jumbo to you, you should have been there! Peter first dowsed for a GS line in the Slimbridge Village Hall. He then dowsed the auras of a couple of volunteers standing outside the GS line, and again within it. Even the largest auras were diminished to some degree. An experienced dowser such as Peter can move or ”heal” such lines, and convert the negative energy to beneficial. If the cat comes to sit on your lap every evening, it might be worth getting your home checked for GS. 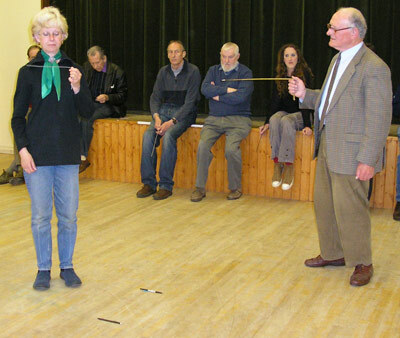 There are plenty of expensive meters and ”magic boxes” on the market, but all you really need is a pair of dowsing rods.